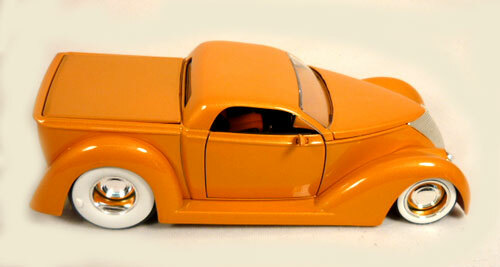 Check out this 1937 Ford Pickup Truck 1:24th Scale by Jada and of the D-Rods collection. The doors open towards the back like suicide doors. It has a detailed black and white interior with chrome shifter, steering wheel, peddles and dash gauges. The hood opens to reveal a detailed white and chrome engine. The truck bed cover comes off of this free wheeling model. I has wide white wall tires and chrome moon hub caps.